Iced Tea Cubes: Are You Making this Iced Tea Mistake? You are here: Home / Learn / Are You Making This Iced Tea Mistake? Are You Making This Iced Tea Mistake? 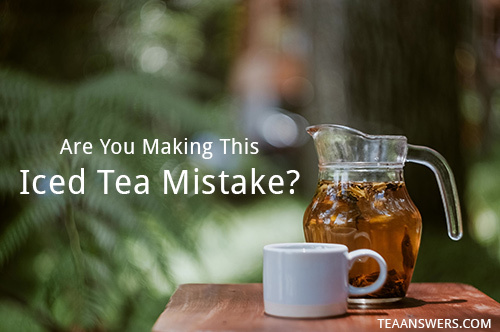 What is one of the biggest iced tea mistakes you could make? Ice cubes! Don’t use ice cubes in your iced tea. That’s right! Don’t use ice cubes in your iced tea if you’ve made the ice from water. Why have watered down tea? When you use ice cubes made from water, your tea will cool to that icy goodness and that’s great. But when you use water to make your ice cubes, you will make your tea weaker. By the time the ice has made your tea cool, you will have a layer of water on top of the tea. Guess what you drink first? Yes, you got it! Water. It may be cool water, but you’re still drinking water and your tea will barely be cool. And even worse than that your tea will be diluted from the ice cubes melting in it. So, what’s a better way to cool down your tea? Make your ice cubes with tea, not water. When you make tea, make an extra cup. Pour it into an ice cube tray and freeze it. When you want ice tea, pop out that deliciously iced tea cub and plop a cube or two into your glass. Fill your glass with fresh tea. If you like lemon in your ice tea, make lemon ice cubes. Squeeze several lemons to fill the sections of an ice cube tray half-full. When you want lemon in your ice tea, start by adding one lemon ice cube. If you want more lemony flavor, add another. Green tea makes great ice cubes. Steep your favorite green tea for less than the recommended time. Let it cool and pour it into the ice cube tray. Green tea oxidizes quickly and can taste bitter. Steeping the green tea for less time keeps it from being as strong and therefore, your ice cubes will be less bitter. Black tea ice cubes are fantastic. Use the same black tea in your ice cubes that you will drink as iced tea for a powerful burst of tea flavor. Brew your favorite black tea and let it cool to room temperature. Pour it into ice cube trays and freeze. Do you like iced herbal and fruit teas? Herbal teas make great ice cubes for iced herbal tea. Lemon verbena, peppermint, rooibos, hibiscus and elderberry are just a few of the great herbs and fruits that you can use to make ice cubes. Prepare the herbal or fruit tea for the recommended time and let it cool to room temperature. Pour the tea into an ice cube tray and freeze. When making ice cubes for your black tea, add lemon juice to the black tea in the tray. Now you have everything together ready for you! Less time to make that glass of delicious coldness and more time to sit back and enjoy your glass of iced tea. Add herbs to the ice cube tray. Making green tea ice cubes? How about adding pieces of fresh lemon verbena, lavender, or cilantro to the ice cube tray before you pour in the cooled green tea? You may need to poke the herbs into the tea to get them wet so that they will stay under the tea. Peppermint iced tea is delicious. Make peppermint tea with any of these recipes. As it cools, chop fresh mint and add to an ice cube tray. Pour the cooled peppermint tea into the tray and freeze. For the tastiest glass of peppermint iced tea, brew a new pot or cup of peppermint tea, let cool and add your frozen peppermint-on-peppermint ice cubes. Another approach to making tea ice cubes is to use cold brew or refrigerator tea, which gives you cool tea to start the process. Brew your favorite tea in your refrigerator. After brewing, pour the cold tea into an ice cube tray and freeze. You will need to wait a few hours or overnight to get the cold refrigerated tea, but try this method to see if there is a flavor difference. Try adding herbal or fruit tea ice cubes to your favorite black tea for a different flavor combination. Or use just one or two of herbal or fruit tea ice cube flavors for just a hint of something else in your icy glass. Have fun! Be creative! Drink more tea! Should You Squeeze Your Tea Bag? How Long is Tea Good for in the Fridge?